Brown ground beef in skillet over medium-high heat, drain. Stir in 1 cup (250 mL) water and seasoning mix. Cook for 10 minutes until thickened, stirring occasionally. Place a generous layer of chips on a heat-proof serving plate and top with a layer of ground beef and salsa, as desired. Sprinkle with cheese. Place under preheated broiler until cheese melts. If desired, add your favourite toppings, such as avocado, shredded lettuce or sliced olives. Serve immediately. 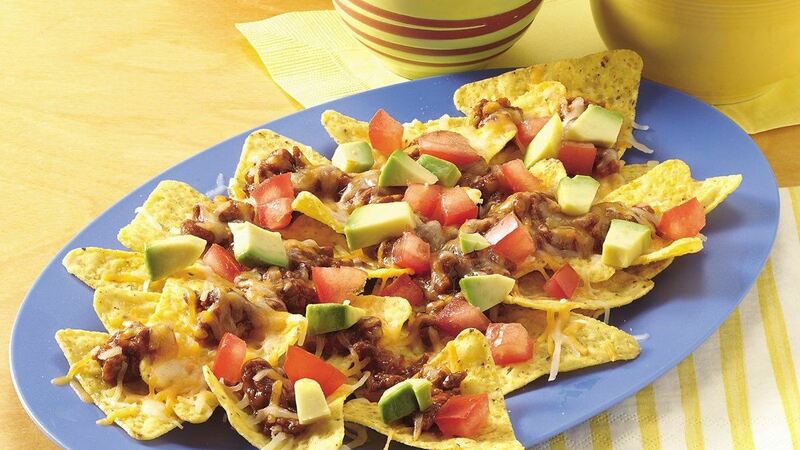 Tip: For vegetarian nachos, replace ground beef with 1 can (398mL) Old El Paso* Refried Beans.